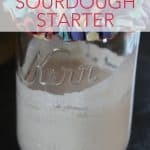 Gluten-free sourdough starter - how to make your own! Fermented foods have the ability to make food easier to digest as well as provide our bodies with needed nutrients. Sourdough is one of those fermented foods and my goal for a while has been to make a gluten free sourdough starter. It’s been a few years since I’ve taken the time to experiment with sourdough bread, it always seems so tricky… and I got tired of baking bricks. I was able to make a few good loaves, but never with consistency. The one sourdough food we really loved though was pancakes. So easy to make and deliciously light. As we discussed before in my post about digestion, preparing foods properly is really important. It helps our bodies absorb more nutrients and it is easier on the gut, causing fewer issues. One of the ways to properly ferment grains (bread) is to use the sourdough method. This method has been used for centuries; our great-great-grandmothers worked in their kitchens making this traditional bread, their cupboards held a jar of the starter. Instant yeast was not easily accessible, if available at all, so sourdough was the only way they could get bread to rise. All in all, sourdough bread is much easier for the body to digest and as an added benefit it makes it easier to absorb more nutrients from the grain itself. Perfect for all of your GF sourdough needs. It's important to have water free from chemicals, specifically chlorine as it may damage the starter. If you have city/tap water (versus your own well) you can place a jar or bowl of water, uncovered, out on the counter overnight. You can also boil the water for ten minutes and let cool to room temp. 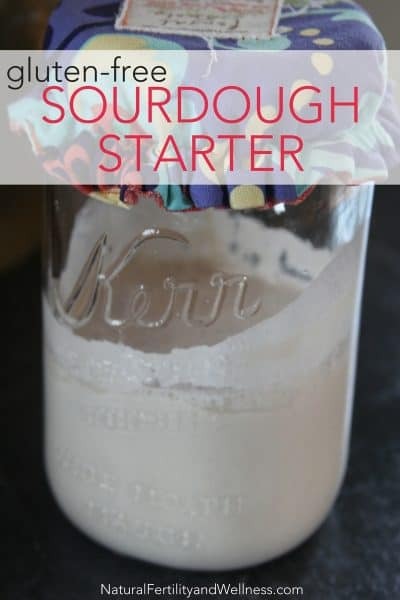 If your starter doesn't seem very active, you can "boost" it a bit by adding a tablespoon of water kefir. At day seven you should have enough starter to make your first sourdough recipe! It is important to keep your starter in a warm place; if it gets too cold it won't be active enough to work. I find that keeping mine in the oven with the pilot light on can help immensely during the cold winter months. Others find that they can place it next to the stove or on top of a refrigerator for warmth. This starter can also be used to make a gluten-free artisan sourdough loaf as well as gluten-free sourdough pancakes! Gluten-free starters tend to not last as long as their wheat counterparts and I find myself making a new one about once a month. In my goal to make more ferments in our home, I’m beginning to experiment again, and we currently have a nice little gluten-free sourdough starter happily fermenting away on the counter. How did I never know this was so easy…?? Hmm…do you have a bread recipe using your sourdough starter? @Renee, I have one that I’m playing with, but it’s not good enough to share yet! 🙂 I’ll be posting our pancake recipe later this week though. @donielle, Perfect! Thank you! I’m very excited to try this! Thank you for this! 😀 My mother-in-law read in some book (I don’t remember what it was called) that the process of making sourdough bread rendered the sourdough bread gluten-free, but she wanted to make it with a gluten flour, and since my husband is allergic to gluten, I was NOT happy. Sourdough bread is a favorite of my husband’s so I’m excited about the possibility of being able to make it for him! Do you know of a good dairy & egg free sourdough recipe? @Stephanie, Many sources and studies say that the process of sourdough does in fact lower the gluten content. But by how much I don’t know. It can drastically reduce it, but then it also depends on the method used to make the bread. Some recipes call for only a four hour rise, others call for 12+ hours and I’m sure that the amount of time the wheat flour is being fermented will make a difference. I would not recommend a wheat based sourdough for anyone with an autoimmune disease, but for those with an intolerance, they may be able to tolerate it just fine if they also implement some type of digestive healing as well. I make my own sourdough starter but I like to use grapes, after rinsing them I fill a pint jar with fresh grapes let them sit for 5-6 hours I take 1/2 c of grape water [refrigerate balance of water] mix with 1/2 c whole grain flour, wait 24 hrs. add another 1/2 c of grape water and white flour, wait 24 hrs. repeat until bubbles start save 1/2 cup then repeat every 12 hrs. l use 1/2 to make pancakes or biscuits and double the starter by adding enough flour and water to make 1 c.
If I am making bread I would make a sponge at night, that is I would dump my starter into a bowel add 1 c water and 2 + c flour to make a very sticky dough [like biscuit dough] cover and let it ferment [double or triple in size] over night until it starts to reduce in size then I would add 2 tbsp. olive oil 2 tbsp. maple syrup mix it down in a 2 c measuring cup mix 1 c flour 1 1/2 tsp. salt 1/4 tsp. fruit fresh [ascorbic acid or 1 tsp. lemon juice] add the flour to the starter mix turn out onto a floured surface and knead in enough flour to make silky let rest covered for 30 minutes knead and shape place in non stick baking pan let rise till double and bake at 425%F for 35 min. The starter left in the jar you mix with 3/4 water and 1 + flour to make a sticky dough let rest covered with the sponge till morning to till double or triple then refrigerate till needed or refresh once every 2 weeks. Making the sponge has been the greatest because it allows the fermentation to take place thus converting the starches to lactic acid and the glutens to proteins thus reducing the G Index rating from 100 to 65 making it much healthier and beneficial it also increasing the number of cultures in the ferment making it rise faster. When my bread is in the pans they usually only take 2-3 hrs. to rise. I place them in my oven to rise with a pan on the rack below which I pour boiling water in and shut the door the extra moisture helps them rise, I usually just turn my over on and set the timer without removing the bread when they are ready to cook. I do not know how this will help you with your GF sourdough but I surly hope it helps. I myself was gluten sensitive and spent more than a year without gluten in my diet, now thank God and sourdough I am not reacting. @Stephanie, That is really interesting! I am gluten intolerant (mainly just feel more tired and get ocular migraines), but I can tolerate home-made sourdough bread surprisingly well! I wasn’t sure if it was just coincidence or if it truly is easier to digest. This helps explain it! Holy cow. I had no idea this would even be possible. We ahve been gluten free for nearly a year (I have hashimotos) and I just figured sour dough was never going to happen. What is the advantage to this. A light and delicious pancake? I assume since we would cook it then it loses the probiotic part. Is it wo make the Brown rice flour more digestable? Some people mention using sour dough “whey” to culture other things. Would this have that as well? I am really excited about this. Thanks! I’ve never used the ‘whey’ to make ferment anything else, just bread products. The liquid that usually forms on the top is also called hootch because it’s normally slightly alcoholic – I don’t think it’d be good for fermenting much of anything. Just wondering if you think whey or apple cider vinegar would work in place of the water kefir…. @Raia, Hmmmm….I don’t know. I can’t imagine ACV would work well as it doesn’t have the same fermenting properties that kefir does. I’m excited to try this and make the pancakes too! Thank you so much for sharing. I have learned so much from your site! I have been really wanting to try making sourdough bread. Unfortunately, my husband and I are going grain-free due to leaky gut syndrome and severe eczema. We haven’t had rice in over 6 months. I am worried that this seemingly healthy bread might send us into an itch attack! Plus, I have also heard that rice flours don’t have much nutrition. What are your thoughts on brown rice flour? Do you know of any grain-free sourdough options? Thanks so much. @Jennifer, There are plenty of times in life when even a healthy food may not be healthy for someone. So although I blog certain recipes….not everyone can try them. If brown rice is giving you problems, then leave it out until you can try it again. And I personally don’t use 100% brown rice in my baking, as it’s best to use a mix when working with gluten free flours. So the amount of brown rice we consume is actually fairly low. I have not heard of a grain free coursough option….but that doesn’t mean there isn’t one! @Erika, Let me know if it works out! I’ve just started being on a grain-free diet. 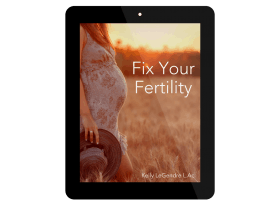 I have hypothyroidism/adrenal issues, amongst other issues. 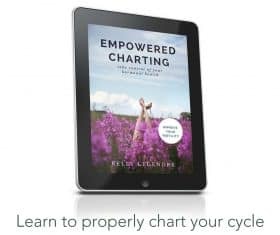 I’ve been doing a lot of reading on going paleo/grain free….I’m hoping this helps! 🙂 I’m feeling discouraged, yet encouraged! @Hannah Elise, I haven’t tried it! 🙂 I do use millet and sorghum in the starter though from time to time, but usually stick to brown rice as it’s a cheaper option for me. But when I make our pancakes (or other bread product) I always add in other flours as well. What about using almond flour? I’m on a grain-free diet…. @Erika, I’ve used crispy almond flour (“crispy” means soaking the almonds to make it more digestible and dehydrating the almonds at about 105 degrees to retain its enzymes). My experience with almond flour is that it does not have enough carbohydrate calories for the water kefir for it to ferment well. So if you do use it, expect that it will take way less time to ferment. How well it will rise is an entirely different question. Hi. I was wondering why you use water kefir instead of dairy and if you think dairy would work. I make milk kefir, so I have that. I don’t have water kefir. Thanks! I have been doing research for health reasons and have come across some disturbing information on yeast based breads. It seems that when the commercial, lab created quick yeast reacts to the starches in bread flour they explode resulting in an energy signature that is the same as cancer. When this yeasts react to the gluten the result is A.G.E. which irritates the bowel like coarse sand paper would, the result is an increase in the mucus thus preventing most of the nutrients from being absorbed. This creates malnutrition in a land of plenty. I am interested in making gluten free sourdough bread for a family member who is gluten intolerant [celiac], and would appreciate any help you can give me. their second meal and lasted even hours after. This shows that what you have for breakfast influences how your body will respond to lunch.” He said it’s likely that the fermentation of the sourdough changes the nature of the starches in the bread, creating a more beneficial bread. And while sourdough came out on top, the whole wheat varieties used in the study came out on bottom – even below white bread. The whole wheat breads caused blood sugar levels to spike, and these high levels lasted well after lunch. Graham said the less positive blood responses sparked by the whole wheat are likely due to the fact that the milling process involved in making the whole wheat bread used in the study is similar to that used for white bread. This is not the case with all whole wheat or whole grain breads, he added. “The parts of the grain like wheat germ and bran that have the health benefits are taken out to create white flour and then partially added back in to make whole wheat. Based on the findings of this study, as well as a follow up study using whole grain rather than whole wheat, we are learning that the best way to get these nutrients is through a whole grain bread, not whole wheat.” Funded by the Ontario Ministry of Agriculture, Food and Rural Affairs, the results of this study have led Graham and a team of researchers to continue studying the healthy benefits of sourdough bread and whole grain”. I did not like to delete any of this in article case it was beneficial to some one. I have the other research on the yeast if anyone is interested. I have since started making sourdough bread and have encouraged may others. I love your sight and wish every one great success. Thank You for your help and the great enjoyment I get reading all the recipes. Hello, could I use whey from milk kefir? Many thanks for your wonderful recipes and ideas. Using whey from kefir, or kefir, wouldn’t be a traditional sourdough, but could probably be done.